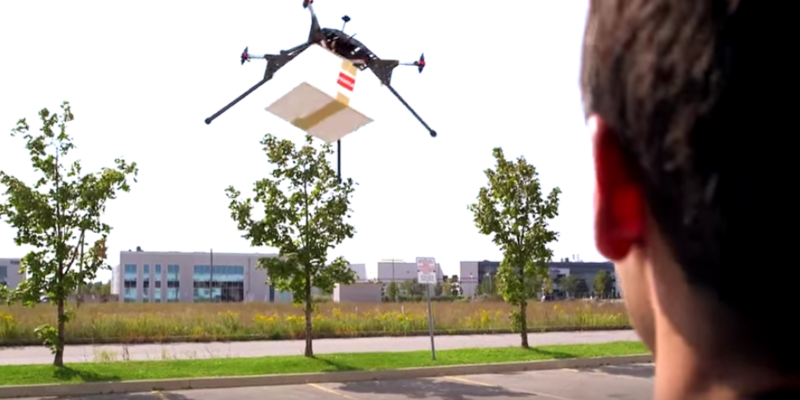 Drone Delivery Canada (DDC) announced that Transport Canada approved its ‘Falcon’ drone for testing in Canada. The Falcon can carry up to 22.6kg (50lbs) of cargo and travel at a range of 60km. The drone has been in development for over a year and just received approval from Transport Canada to begin testing in Southern Ontario. “Our engineering team is very proud of the development and approvals now for the Falcon. We continue to push the envelope in building bigger, larger cargo capabilities within our drone fleet of vehicles,” said Paul Di Benedetto the company’s CTO in a recent press release. The Falcon has a wingspan of 12-feet (365cm) and can carry an object that is five cubic feet large. It’s the larger sibling of DDC’s older Sparrow drone.